There’s no question that you can find anything you want in Las Vegas, you just have to know what you’re looking for. This summer, Sin City takes indulgence to new levels. Whether you’re looking to dine, lounge poolside, spa or party into the night—don’t miss these four Las Vegas experiences that take eating, pampering and playing to new heights. 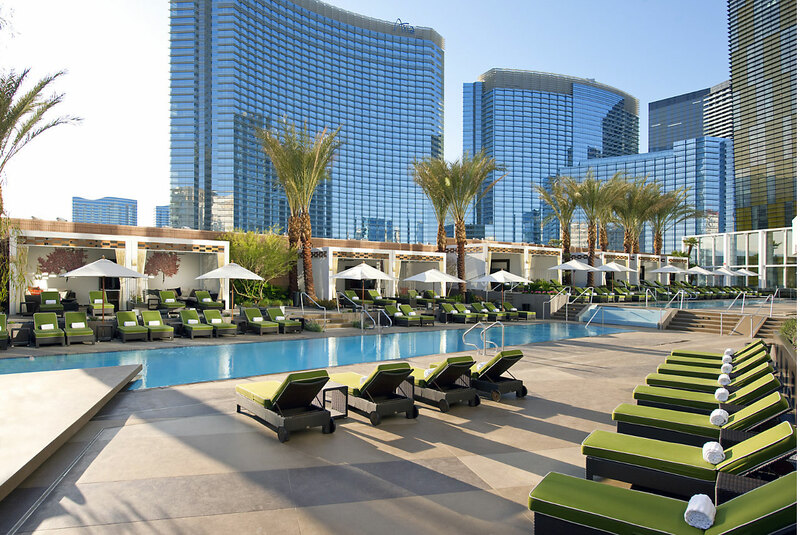 This new Suite Cabana package at the Mandarin Oriental Las Vegas takes luxury to new levels this summer. Pamper yourself through Sept. 8, by booking a Strip View Suite or higher in the 47-story City Center property, and get a complementary pool cabana to go with it. The cabanas are located on the eighth-floor pool deck, which boasts two pools, two Jacuzzis and one plunge pool. Each cabana comes equipped with a complimentary mini bar stocked with non-alcoholic refreshments, sun care amenities, a 48-inch flat-screen TV, magazines and newspapers. Need a PlayStation 3 to complete your experience? No problem; you can add that on too. Pool attendants are also on call to assist you and will circulate every hour with a selection of different services and amenities including mini-smoothies and frozen fruit. “Fish meets field” in the newest outpost of Top Chef alum Brian Malarkey’s ocean-to-table concept, which already delights diners in La Jolla and Santa Monica, California. The dining destination is located in the ARIA Resort & Casino and features indoor-outdoor dining with a lush 5,500 square foot patio. Executive Chef Geno Bernardo turns out refined and playful market-driven menus that complement mind-blowing raw offerings from Salt & Brine Bar. Menu favorites include whole grilled branzino with saved fennel salad and salsa verde; 18 oz. 40 day-aged “Creekstone Farms, KS” ribeye; and whole fish ceviche. In true Vegas fashion, indulge on cocktails like the Tiki Bandwagon with Atlantico Platino rum, Appleton Reserve rum, gingersnap, orgeat, lime and chocolate; and Better Mules & Gardens with Crop Organic Cucumber vodka, rhubarb, strawberry, lime and ginger beer. One of the newest nightlife concepts to hit Las Vegas, Jewel Nightclub features a 24,000 square-foot bi-level multifaceted space. The club is run by the Rockwell Group, which is known for seamlessly integrating technology into their concepts. Stand out features at the club—in addition to their slate of top talent every week—are mezzanine VIP suites. This “club within a club” offers four distinct designs ranging from speakeasy to sports to retro 70s and prestige. You may need a little detox after all your indulging. That’s where new The Spa at Red Rock by Well & Being comes in. Located just off the Strip at Red Rock Resort, you can pamper yourself with a fully customized wellness experiences, including cutting-edge fitness classes, nutrition, integrative medicine, mind-body therapies and advanced Lancer skincare spa services (the first non-medical facility in the US to offer it).